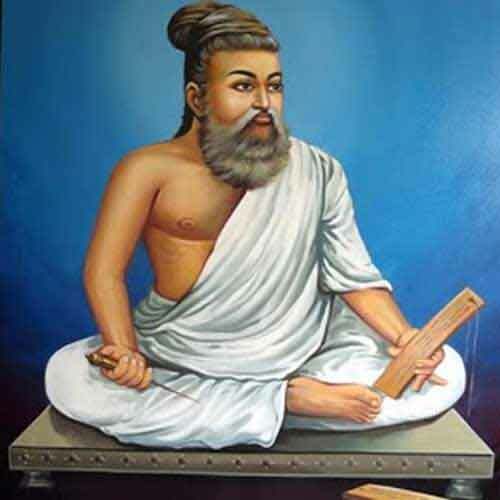 Thirukural composed by Sage Thiruvalluvar contains worldly wisdom and universal truth. Below are the Quotes and Teachings from Thirukkural of Thiruvalluvar . If a man be his own guard, let him guard himself against rage. Left unguarded, his own wrath will annihilate him. Gentle speech flows from love, is free from deceit, and is as music in the mouth of the virtuous. Gentle speech, with a cheerful countenance, surpasses the gift of the wealthy. Amassing great wealth is gradual, like the gathering of a theater crowd. Its dispersal is sudden, like that same crowd departing. Should a fool fall upon a great fortune, strangers will feast while his family starves. One who has realized by himself his soul's Self will be worshiped by all other souls. As the intense fire of the furnace refines gold to brilliance, so does the burning suffering of austerity purify the soul to resplendence. It is the nature of asceticism to patiently endure hardship and to not harm living creatures. So potent is the power acquired through disciplined self-denial that those who attain it may even delay the moment of death. True knowledge is an inner fortification that enemies cannot destroy, and is the ultimate, impregnable defense. True knowledge controls thought and conduct and keeps both away from evil, and helps one to keep in that right path. The wise conserve what is already gained before entering on a doubtful undertaking. Think well before resolving on action. Hesitation after the decision is taken is bad. These two are complementary principles of action. The hair on the head is a thing of beauty. Removed form its place, it become filth. The same is the fate of men who descend from their own level of honorable conduct and demean themselves. If we eat only after making sure that what has been already eaten has been digested, no medicine will be required to keep the body in good health. The face may a wear a smile at the sight of one friend, but he only is a friend whose sight brings about an internal joy which fills the whole soul. When your reason or conscience tells you that a thing is unworthy of you, it is folly to waste your mental energy indulging in thoughts about it. The self inflicted miseries of ignorance are greater than what can be inflicted by enemies. Anyone can formulate plans, but it is only exceptional men that are able to carry their plans to fulfillment. Some men have an unimposing appearance but they may be blessed with great strength of mind and action like the little axle-pin that keeps the wheels of the chariot in place. Appearances deceive. Do not judge men by their appearance. Plan with a clear brain, and when once you have decided and launched on an undertaking, be firm and unmoved by difficulties and avoid dilatoriness of action. Quickly moving away from wrong and improper actions is one of the essential elements of good character. It is better to be without friends than to depend on friends who when you face trouble desert you. Man of true knowledge knows beforehand what will befall. Thereby, he escapes even stunning grief. He who is not vigilant will repent later in vain. Relatives when they become evil minded are a danger to be guarded against. There can be no real union in a community when there is mutual hatred concealed in the mind. The hair on the head is a thing of beauty. Removed from its place, it becomes filth. The same is the fate of men who descend from their own level of honorable conduct and demean themselves. The quick and instinctive shrinking from wrong and improper actions is one of the essential elements of a good character. Unlike the ignorant, the man of True Knowledge knows beforehand what will befall. Thereby he escapes even stunning grief. If we accept that man should enjoy happiness for his good deeds; why should we deem it wrong for him to suffer sorrows for his vile ones. One-sided love is pain. But mutual love, like balanced load on both sides, is sweet. The wound of fire is cured soon by treatment within days; those of harsh words remain raw as long one is alive. He who controls his five senses – lust, ire, greed, attachment and envy – becomes powerful. Deeds performed with clean mind are known as righteousness. Those done without mind and heart are mere show pieces. He who controls his five senses becomes very powerful. Avoid greed, ire, envy and harsh words of haughtiness. That is the right conduct of man on earth. Piety is righteousness. Through righteous conduct man gains wealth and fame on earth. Deeds performed with clean mind are known as righteousness. Love is the sacred link to bring lives of men together. Sweet words are like sweet fruits whoever knows their taste will never use haughty words. Go straight for the goal whenever circumstances permit. When circumstances are against, choose the path of least resistance. Before taking up any enterprise, determine first the exertion necessary, the obstacles on the way and the expected profit at the end. The way to succeed in any undertaking is to learn its secrets by taking the advice of the person who is an expert in it. A whole sea of troubles will disappear the moment a knowledgeable mind collects itself to face them. Let all your purposes be grand; or then even if they fail your glory will never tarnish. An aspiring spirit is man’s basic strength; without it men are like vegetables. The delicate anicham flower withers when merely smelled, but an unwelcome look is enough to wither a guest's heart. Among the wealthy, compassionate men claim the richest wealth, for material wealth is possessed by even contemptible men. Wealth that is acquired by proper means in a manner that harms none will yield both virtue and happiness. Those without wealth may one day prosper, but those without kindness are utterly destitute. By removing the incurable cancer called hatred one reveals one's undying and undiminished radiance. Dread hatred from within and defend yourself against it. In calamitous times it will cut deeper than a potter's knife. Equal are all in birth; distinctions are the result of greatness in action in some and the absence of it in others. As virgin guards her own purity men should guard their unsullied greatness. The great minds hide the faults of others from view; but the little ones busy themselves only about the faults of others. The hair on head is a thing of beauty. Removed from its place, it becomes filth. The same is the fate of men who descend from their own level of honorable conduct and demean themselves. The end of all deliberation is to arrive at a decision; and when a decision is reached, it is wrong to delay its execution. Never trust men without testing them, and after testing them give each one of them the work for which they are fit. The man of action lets his purpose appear only when the purpose is achieved: for an untimely disclosure may create obstacles that cannot be surmounted. Let the thing you decide to do be above reproach; for the world looks down upon the man who stoops to a thing that is beneath himself. The people who have the will power and persistence will attain whatever goal they desire in the manner they desire. The four qualities wanted in a leader – courage, liberality, knowledge and energy. Alertness, learning and quickness of decision are essential for a leader. Men of spirit do not lose their heart when they meet with defeat – like the elephant plants its legs only more firmly when it is hit by the deep piercing arrow. Procrastination, forgetfulness, sloth and sleep – these four are the cosy pleasure boats of those that are fated to perish. People with determination will achieve whatever they aim in the manner they aim. Whatever else you do not reign in, reign in your tongue, for an unbridled tongue will utter foolish things and will lead you to misery. All the desires of a man will be fulfilled on the instant if from this heart he banishes anger. Gifts to the poor alone can be classified as gifts. All other gifts are of the nature of expecting something in return. Unfinished work and unsubdued enemies are like unextinguished sparks of fire. They will grow over time and overwhelm you. Do with deliberation those things which require detailed consideration and for which enough time is available. For those things that require prompt action, don’t waste a lot of time in deliberation. Virtue enhances joy and gain; forsaking it is fall and pain. In spotless mind is virtue found and not in show and swelling sound. Motivation is a pride to possess. Will power is the motivation to energize activity; in its absence, worldly wealth departs. The kindly ones, even in harder times are sure to serve like a well in a dry riverbed. Those who love their life, dare not pursue evil, however trivial it may be. Like a tortoise withdrawing five limbs into its shell, those who restrain the five senses in one life will find safe shelter for seven lives. Just as the Earth bears those who dig into her, it is best to bear with those who despise us. Water is sufficient to cleanse the body, but truthfulness alone can purify the mind. Self-control will place a man among the Gods, while lack of it will lead him into deepest darkness. Prosperity and ruin issue from the power of the tongue. Therefore, guard yourself against thoughtless speech. Think well before taking up any work. To start thinking after beginning the work is disgraceful. No one can blame you if nature has not endowed you with superior intelligence; but to have knowledge and to fail to put forth our best effort is blameworthy. There is nothing that is impossible if one brings to bear on one’s work the instrument of a vigilant and resourceful mind. Who strive with undismayed, unfaltering mind, At length shall leave opposing fate behind. Avoid envy, greed, anger and harsh words. That is the way to acquire righteousness. Good character and virtuousness is to be given more importance than one’s own life. They alone are joys which springs from a virtuous life: all other pleasures end but in disgrace and sorrow. There is no greater good than righteousness and no greater ill than the forgetting of it. Be spotlessly pure in heart. That is righteousness which is free from these four things: envy, lust, wrath and harsh word. Virtue begets honour as well as riches and so can there be a greater good for mankind than virtue? What is aimed at is easier to achieve when one pursues relentlessly with a firm mind. There is nothing hard to achieve for those who persist vigilantly with passion to achieve. Perseverance will bring prosperity and the lack of it will only breed poverty. The world will abandon those who give up their tasks midway unfinished. Even if fact acts against your mission, you will be rewarded for your efforts. Evil deeds follow as our shadow and ruin us. Like that tidal waves that ebb and rise to the shores by the force of hot air currents, desires are endless. Real sacrifice is to burn the burden of boundless lust. Sights of greenery and prosperity are rare in the world when rains fail. Name and fame are for those who diligently employ their senses of taste, sight, touch, sound and smell. Love generates aspirations for kind acts; that in turn springs up natural friendship. If the pain of pains called desire be kept out, one can even in this life attain unbroken happiness. If the desire to attain the Real is truly strong, the dropping of any form of worldly desire becomes easy. If one’s heart is set on ending the round of births, there is no purpose in keeping any attachments alive. Even the body is a burden to be got rid of soon. There is no worthier object to desired that deliverance from births, and this worthy desire can be fulfilled if we renounce desires. Though others inflict wrongs as painful as flaming torches, it is good if a man can refrain from inflammatory tantrums. Forget anger toward all who have offended you, for it gives rise to teeming troubles. It is restraint that restrains rage when it can injure. If it cannot harm, what does restraint really matter? Giving to the poor is true charity. All other giving expects some return. Great, indeed, is the power to endure hunger. Greater still is the power to relieve others' hunger. The fiery scourge called hunger never touches the man who shares his daily meal with others. More bitter than even a beggar's bread is the meal of the miser who hoards wealth and eats alone. Family virtues naturally persist, but might disappear unless kept up by unwavering industriousness; even a temple light will go out unless the wick is not properly looked after. When men are fated to be destroyed, procrastination, forgetfulness, languor, and sleep are festive boats that wait to tempt and take them. One can make up for many natural defects through industriousness. Life functions really in love – Without tenderness of heart, the body is but bone covered up with skin. In love alone is the secret of life. The domestic state of that man whose mind is without love is like the flourishing of a withered tree upon the hard desert. Just as the outer ear or eye may be there, but it is no avail to the deaf and the blind, similarly the life of a householder is purposeless and soulless without a tender heart. If any friend or relative go away but come back not for affection but for a selfish motive of their own, such relatives and friends should not be given space and should be summarily rejected. There is no greater wealth one can acquire than Dharma and no misfortune greater than the forgetting of it. Keep the mind free from evil thoughts. This is what Dharma is all about. External observances of Dharma are only sound and show. Only the joy that comes from right conduct is true happiness. Other pleasures are really sources of pain and causes of shame. Wealth leads to dharma as well as happiness in this life, if it is acquired with discrimination in the right way and without doing evil. Several verses from Thirukkural on why we should use words carefully. Quotes on good speech and kind words by Thirukkural of Thiruvalluvar. fall from the lips of virtuous men. are sweet words spoken with a cheerful smile. spoken from the heart are virtue's way. those who speak joy-producing words to all they meet. that adorn a man; there are none other. his virtues will wax and his vices will wane. when they do not wander far from usefulness and agreeableness. imparts pleasure not only in this life, but in the next. having observed the happiness that kind words confer? is like eating unripe fruits when ripe ones are at hand. The most precious wealth is the wealth acquired by the ear. Indeed, of all wealth, that wealth is paramount. Though he has no learning, if a man listens to the learned, that will serve as his staff of strength in adversity. Words from the lips of upright men are like a steadying staff in a slippery place. Let a man listen to good things, however little. Even that little will enlarge his greatness. Even more wretched that a learned man’s poverty is the unlearned man’s wealth. Like unproductive barren land is the man who has neglected learning. All that can be said about him is that he exists. Pleasant words, full of tenderness and devoid of deceit, fall from the lips of virtuous men. Poverty provoking sorrow will not pursue those who speak joy-producing words to all they meet. Humility and pleasant words are the jewels that adorn a man; there are none other. Words yield spiritual rewards and moral excellence when they do not wander far from usefulness and agreeableness. There is no bigger fool than the man who has acquired much learning and preaches the same to others but who does not control himself. Wherever it may wander, the world follows the farmer's plough. Thus despite all its hardships, farming is the foremost occupation. Farmers are the linchpin of the world as they support all who take up other work, not having the strength to plough. Those who live by the plough live in self-sufficiency. All others lean on them to simply subsist. Those who eat food harvested with their own hands will never beg and never refuse a beggar's outstretched palm. When farmers stop farming, even desireless ascetics will not last long.